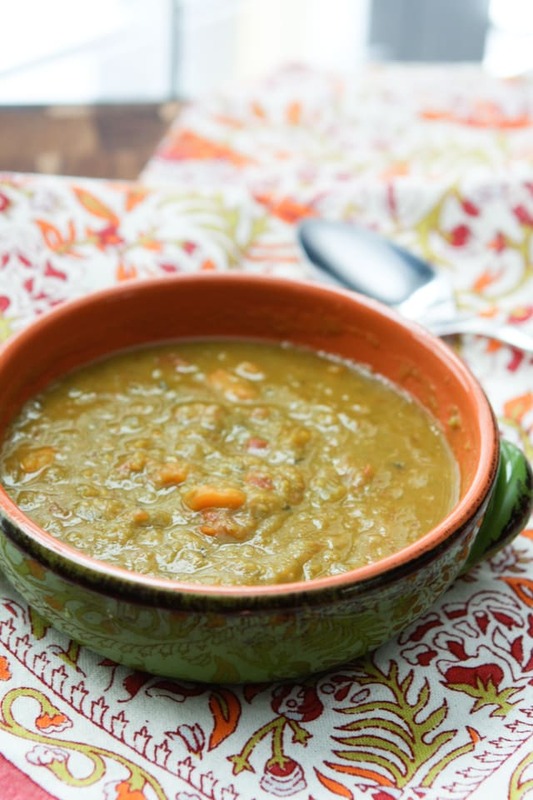 This Slow Cooker Split Pea Soup is hearty and so good for you! A bowl of it will surely hit the spot on any fall or winter day! 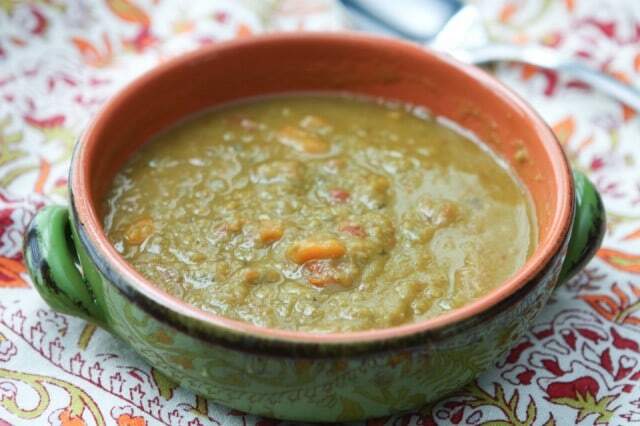 Click here to Pin this Slow Cooker Split Pea Soup recipe! I hope you don’t mind another recipe from the archives…I’m looking for soups to make this week and this one has always been a favorite of mine. I posted it two years ago and thought you might enjoy it right now with the cooler temps approaching. My family is currently in a busy season and I feel since all the Hurricane Irma madness I haven’t been able to catch up with my routine of cooking and sharing with you here. I’ve been cooking, but mostly quick throw together meals I don’t have to think too hard about. I originally posted this Slow Cooker Split Pea Soup recipe in January of 2015. Oh split pea soup…it’s definitely not the prettiest in the category of soups but as far as nutrition goes, it ranks up pretty high in my book. It’s full of fiber, some protein and lots of other vitamins from the peas itself along with all the other veggies added in – and I think it tastes delicious. Anyone else love split pea soup like I do?? I love having soup in the fridge to heat up for quick lunches or for light dinners on busy nights. I really try to make a pot (or crockpot) of soup once a week, and when I don’t I definitely miss it. 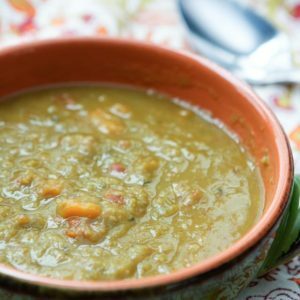 This Slow Cooker Split Pea Soup is vegetarian based, though it would be great made with chicken broth and a bit of ham, if that’s what you prefer. I love it just like this, full of garlic, carrots, celery and some tomatoes. A nice bowl of this soup for lunch or dinner definitely fills you up (in a good way!) and is really perfect for this time of year when most of us are trying to get back on track post-holiday. I don’t know about you, but my clothes are feeling a bit snug this week and I am really making an effort to chug water, eat a ton of fruits and veggies and not mindlessly pick on snacks and sweets that I got into the habit of picking on all throughout the holiday. Hope your week is going great! Make yourself some soup! Some of my other favorite soups to make in the crockpot are this Slow Cooker Italian Sausage and Kale Soup with Sweet Potatoes and Slow Cooker White Chicken Tortilla Soup. I dying to try this Slow Cooker Thai Chicken Soup from Foodiecrush and this Slow Cooker Lemon Rosemary Lentil Soup from Melanie Makes! Add your ingredients to the slow cooker, starting with the split peas on the bottom. Cook on High for 4-5 hours or Low 8-10 hours. Stir well to combine ingredients before serving. Taste for salt and pepper, adjust to your liking. Soups like this split pea soup tend to thicken up in the refrigerator so be sure to add a little water to your soup before reheating in the microwave or the stovetop. I used grape tomatoes because they are what I had on hand but plum tomatoes or even a can of diced tomatoes would make a great substitute. You’ll need a slow cooker to make this recipe as written, but it can easily be adapted to stove-top. Check out other amazing slow cooker recipes on Pinterest. Follow Aggie’s Kitchen’s board Slow Cooker Goodness on Pinterest. okay – i’m going to tell you a dirty secret about myself…. one of my FAVORITE childhood memories is eating campbell’s pea soup (not split pea with ham but the plain “pea soup”) with TONS of saltine crackers. A few months ago I was craving it and could only find it online on Amazon and bought a case! 🙂 Hadn’t had it in YEARS. However, I will now be a grown up and choose to be healthier. 🙂 Pinning this to try soon. Love the addition of carrots. As always, great recipe and BEAUTIFUL pics GirlFriend. We love split pea soup. It certainly doesn’t win any beauty contests but first place winner on taste and healthy. I make mine with homecanned chicken broth, a little ham and fresh rosemary. I have a ham bone in the fridge I think this will be on the table soon. Love pea soup, but never make it. It was totally a “comfort” soup for me as a kid. I, like Kim, loved opening a can of Campbell’s. Too funny! Another great recipe, Aggie! Thank you! One of my favorite things is split pea soup! This sounds great — and simple! I really need to break out my slow cooker more ofter – this is a great opportunity! I love split pea soup and soup in general! I want to make a point to start making more soups to have on hand since I’m working more from my home office these days. Soup for lunch would be perfect! Thanks for the inspiration 🙂 Pinning. this looks sooooo good and easy too. Split pea soup is my favorite! I need to make some now! A TRUE Split Pea Soup is 1 of my favorites. I make a big batch every year ( up to 30 quarts at a time ). I use yellow & green peas— smoked pork hocks— ham & bacon!!!!! And a nice secret is to finish the soup off with a nice amount of dried Marjoram!!!!!!!! Made this yesterday right after I saw it and it was so simple but amazing! Thank you! that is awesome! So happy you came back and told me, thank you! glad you enjoyed it! It might not be pretty but this sounds delicious! Split pea soup is one of my favorites! And you did make it look as pretty as you could in a nice bowl. I love this heated up for lunch. I’ve not had split peas in a long time, your recipe looks delicious and I think my kids would love it too! I’m trying to look for alternatives to sandwiches for lunch every day and will add your soup to my list! Great recipe. Instead of chicken broth, I do ham flavored broth. One can get the jar at Gordon Foods. It last for ages if stored in the fridge. Thanks for the grape tomato suggestion. Certainly soup season here and this looks to be a great one to warm you up. Tomatoes in split pea soup? Never tried it, but why not. We usually add fresh horseradish to ours and finish it with a dollop of cream fraiche. It’s then often serve with cold smoked salmon and lots of bread. those are interesting additions!!! I’ve never used fresh horseradish! Definitely going to try this one. Great for the cold nights and rainy days. The crockpot is such a good way of doing soups. Just pop in the ingredients and forget basically. Great too in that you can leave it to works its magic while you go off to work. Come home to tantalizing aromas and a hearty meal at the end of the day. Pinning this one to my Pinterest board to cook real soon. Like maybe even right now! I make this all the time. I purée at the end. I always use water (not broth) with some extra salt and it’s great. Thanks! !